By Stephen Rust, Joint Managing Director at V360°. As featured in Retail News, July 2018. 80% of us have refused to buy a plastic bag and tried to carry all items by hand, if we forgot our reusable bag. 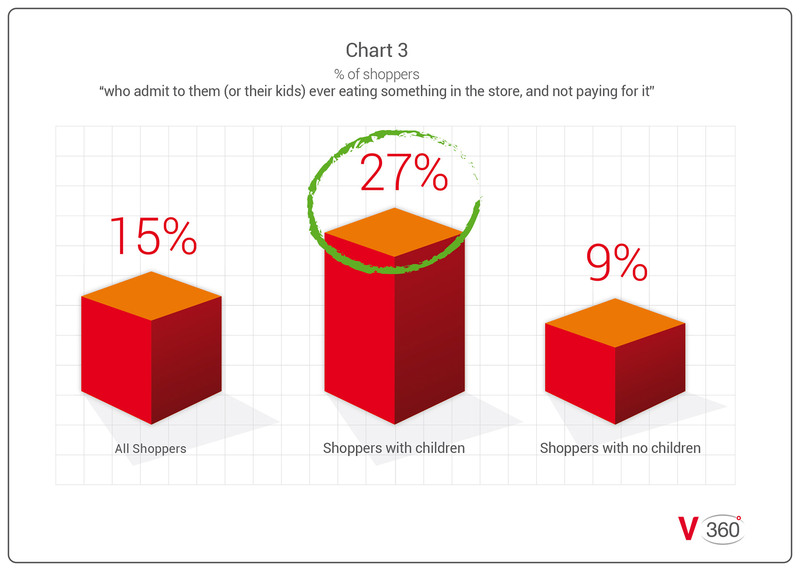 According to new research from V360°, as shoppers we typically make up to eight visits to a supermarket every month, spending an average of 34 minutes each trip. This works out as more than two days a year inside a supermarket. 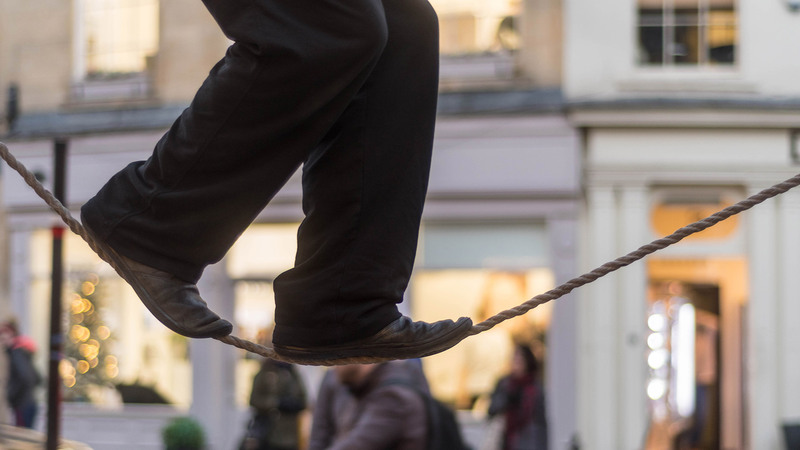 In this time, we have to make thousands of decisions – balancing what we need and want, the hassle of buying it, the time we have available to shop, and most importantly, getting what we perceive is good value for money. This can lead to many weird and wonderful shopping decisions and behaviours. Many of us have arrived at a check-out with a trolley full of groceries to only realise we have forgotten to bring our re-usable shopping bags we inadvertently left on the kitchen table at home. At this point a myriad of choices quickly runs through our mind – spend money on more bags, frantically look for some loose cardboard boxes in-store, or close grip around as many items as possible and hope for the best! In this situation 8 out of 10 of us have refused to buy another shopping bag, and tried to carry all items by hand instead. This is a typical example of balancing perceived value for money for the item, and the effort needed for getting our shopping items home. It can lead to some quite unusual behaviours as many of us have at times left stores, with a stack of items in our arms. This example of quick, and not always the most rationale, decisions has implications for suppliers and retailers as they endeavour to communicate the end value of the product or service they provide to a shopper who is balancing so many other factors in the moment of a shopping journey. From our experience, shoppers spend on average 10-25 seconds at a category fixture (depending on the category), with sometimes less than 1-2 seconds spent reviewing any one SKU. Therefore communicating the reasons to buy a product has to succinctly stand out and work in this extremely tight time frame to have any chance of selling. 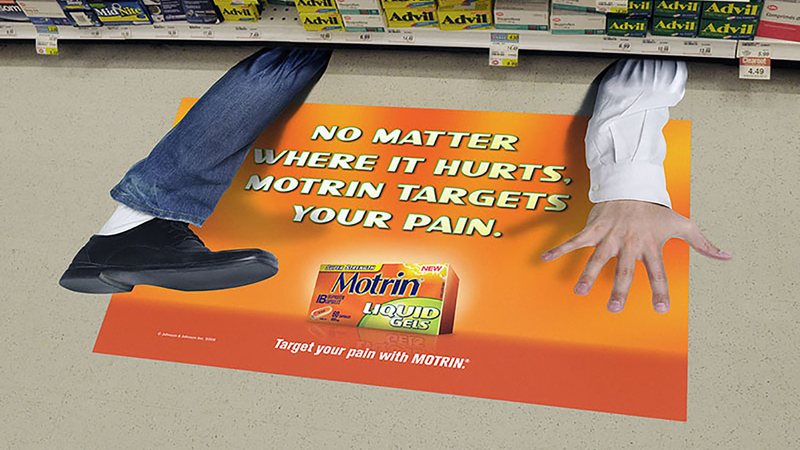 Motrin…In this case the shopper immediately understands the end distinct benefit of the product and the communication creatively stands out for them. The only thing missing in this case is having the end price point in the communications to help shopper make his or her choice in that decision moment. It also makes sense to have the product as close to the message as feasible. 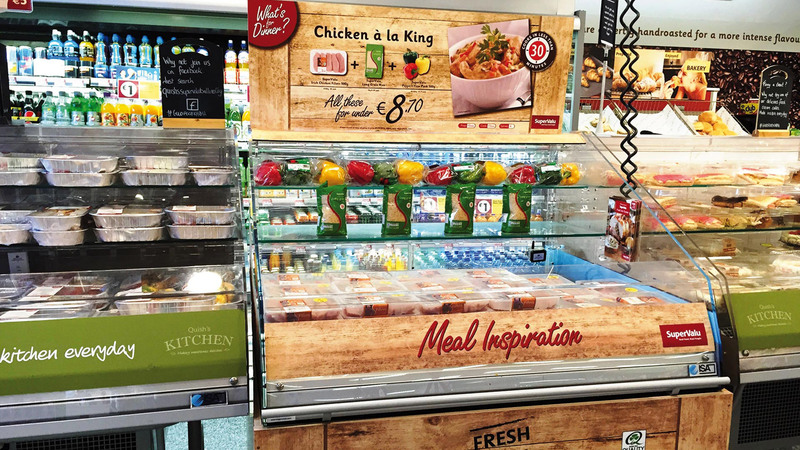 Manor Farm’s convenient dinner proposition is another example where the supplier and retailer were able to creatively make their proposition stand out. It also succinctly communicated the benefits to shoppers of been able to have a wholesome Irish chicken meal in 30 minutes for the price of €8.70. This makes it very easy for shoppers to quickly understand the proposition and decide if this is a good value for money solution for their requirements. Considering the above facts, suppliers and retailers have to consider three important factors when trying to effectively engage shoppers. WHO: Firstly, who are they trying to communicate to and how open-minded they are to messages, as younger shoppers maybe more open to trying something different versus the older (65+) shopper. WHAT: Secondly, what type of communication is most effective with the shopper we are trying to communicate to. 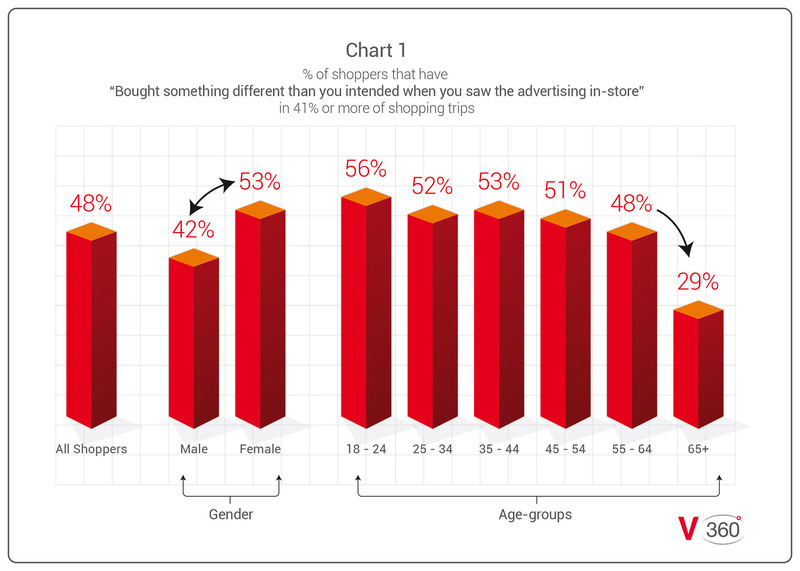 For example, 79% of shoppers claimed they have bought food or drink items after receiving a free sample, and the 45-54 year old shoppers were especially responsive to sampling, with 87% claiming the same. WHERE & WHEN: Thirdly, at what point(s) along the shopping journey can communication be most efficient and effective? 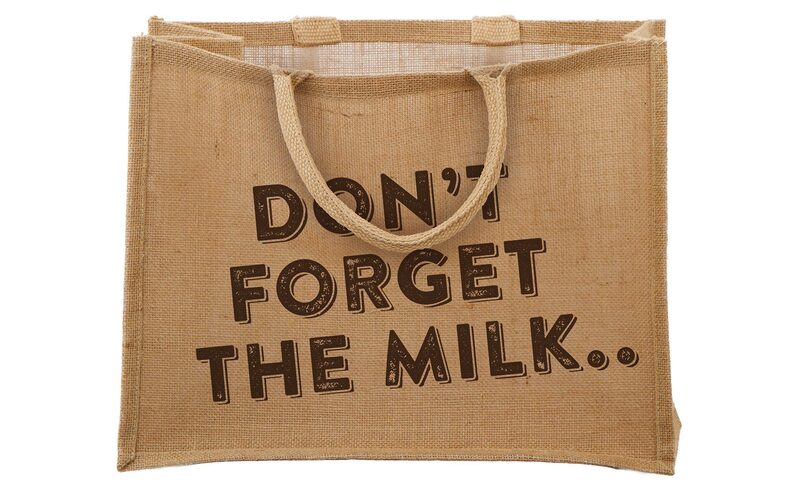 For instance for a supplier of everyday essentials like milk or bread, is a reminder to buy their specific brand on a shopping list, carrier bag, shopping basket or trolley an effective reminder so shoppers don’t forget their intended item. While many of us will go to the shops to shop, 71% say they have gone to a store just to get out of the house for a while, and just over one third of us (36%) have also used a trip to the store as an opportunity to catch up with friends and find out what is going on in the local community. 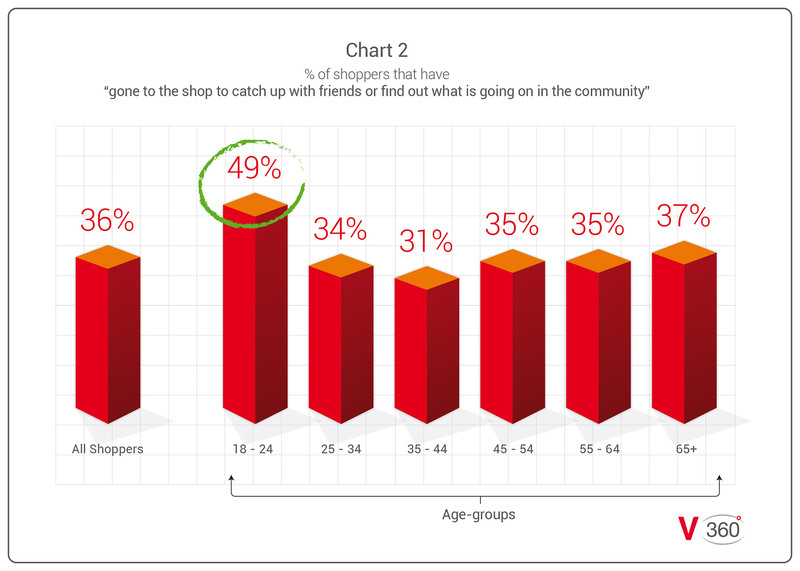 This is especially common with younger shoppers, with just under half of 18-24 year olds using a visit to store as an opportunity to socialise (reference chart 2). This finding does prompt us to consider what solutions in-store, where practical, will help or facilitate shoppers’ socialising needs. We have seen many stores extending their offerings with the development of in-store cafes, food-courts, sit-down areas and interactive news boards. These points in-store can become key areas, especially for food and drink brands, to become noticed and trialled by shoppers whilst in the proximity of the store. One quarter (24%) admit to ordering food at the deli, changing their minds and leaving the item somewhere else in-store without purchasing it. 41% of shoppers who are parents admit that they have left their child in a shopping aisle to have a tantrum while they continued their shop. Interestingly, while some of these less admirable behaviours have to be managed through security procedures, there is also the opportunity to make the shopping experience more pleasurable and seamless for different shopper types and then communicating the value of a better shopping experience, versus just offering shoppers deeper discounts. This research gives a brief insight into the myriad of decisions people have to make, and the real behaviours they often engage in whilst shopping. A better understanding of consumer usage, shopper needs, perceptions and behaviour can lead to more effective and efficient retail and product solutions. This, in turn has a triple benefit of a better shopper experience, while helping retailers and suppliers succeed and thrive in today’s extremely competitive market. As retailers and suppliers can only survive if the solutions they provide are continually purchased by shoppers. Survey Methodology: 1,026 people were surveyed – 51% female, 49% male.